Each year Halloween festival is celebrated on 31st October in the USA and other Christian people of the world. People have started to prepare for the parting and spending time to have this grand occasion. 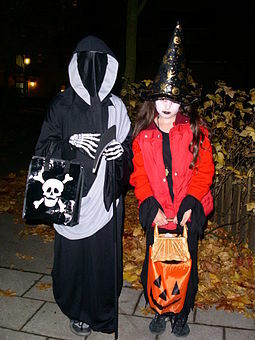 The themes of Halloween revolve around people use humor and ridicule for opposing all mighty ‘death’. Typically the festive celebration involves fancy dress, carving out pumpkin into horror facile figures. The activities may also include burning wood and fire tricks, apple bobbing, visiting haunted places, playing skits, narrating horror stories and of course watching horror movies. Children and grown-ups get busy making various dresses with horror themes and horror makeup. Crowds may play a game popularly known as ‘ fortune teller’. It is interesting to note that one has enter a darkened room where they have set paper cut into various shapes and symbols. First on entry, the hand is put on ice cubes on a plate, the next stage, the hand is to be placed on a platter having the luck ( cut paper). This paper is the awaiting fortune for the player. Here the cut papers have the following funny meaning associated. Dollar symbol – wealth, button-bachelorhood, clothespin- poverty, thimble-spisterhood, ring- wedding shortly, rice- wedding, umbrella- journey. All in all, these celebrations remind one of customs and traditions the of living in parts of the world.